Michael Holmes is back on top of the world tonight after putting in one of the strongest performances of his career to win the Kwinana Cup at the Perth Motorplex, doubling as round five of the Sims Metal Management Late Model Pro Dirt Series. Nineteen of the original twenty one starters of the night would line up for the feature race, with Daniel Green in his first night of the season and veteran, and points leader heading into the night, Brad Blake, unable to make the call. Unfortunately for Jai Mazzini he too would be unable to start after losing his left rear wheel on the form up laps. The rest of the field would line up behind the Pancho’s Pole Position winner and last round victor Paul Stubber, who started alongside Holmes at the front. As the race went green, Stubber led immediately, but Holmes was equal to the challenge and the two crossed the line side by side to complete the first lap. As the duo continued their battle, Stubber suddenly slowed in front of the field as they came out of turn two, cars going every which way to avoid him as he almost came to a stop down the back straight. Just as suddenly, Stubber got going again as he entered into turn three, and with the green lights still on, he hit the accelerator, ending up right back in front of leader Holmes and lucky to not go a lap down immediately. This left Holmes the clear leader with Ryan Halliday in second and Kye Blight running in third. Unfortunately for Blight a moment in turn four a few laps later saw him baulk slightly, allowing the impressive Brent Vosbergen through for third place. Holmes began to make his way through lapped traffic but was able to maintain the lead he had built on Halliday, with Vosbergen firm in third ahead of Blight, while there was a big gap back to Ken Macpherson, Marc Giancola and Warren Oldfield who were fighting it out for fifth. Back up front and Holmes was still behind Stubber, looking to put him a lap down and finally on lap thirteen he did just that, with the lap completed before Freddy Kinsella spun on the next circulation, Chris Pavlovich piling into him and bringing on the only cautions for the race. Somehow both cars were able to restart. The race resumed and Holmes was again away with Halliday close behind, while Vosbergen was now being pursued by Marc Giancola who had made the pass on Blight shortly after the restart, as did Warren Oldfield momentarily. Stubber, despite being a lap down was fighting his way right through the middle of that same battle, which also included MacPherson, Veronica McCann and Daniel Ameduri. With ten to go Holmes had a moment which allowed Halliday to close the gap again, while behind him Vosbergen also had a spin while third and dropped back a few places, seeing Giancola duck through and take the position for himself. Blight was back in fourth by this point having disposed of Oldfield who was now in fifth and had the lapped Stubber on his tail, while Macpherson, McCann and Vosbergen continued to duke it out for a top six position. Holmes built his lead up again and as the white flag flew, he was over one and a half seconds ahead of Halliday, while Blight was able to wrestle third from Giancola in the dying stage. Holmes would grab his second career Perth Motorplex Late Model feature win ahead of Halliday with Blight in third. 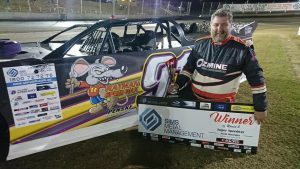 Holmes is now also the fifth different winner in as many rounds of the Sims Metal Management Pro Dirt Series, an exciting stat for all involved in Late Models, such is the level of competition. As the race went yellow after its conclusion, Stubber and Giancola came together in turn two, with both suffering what appeared to be significant damage to their machines, their rivalry hitting an all-time high after building at each and every round so far this season. 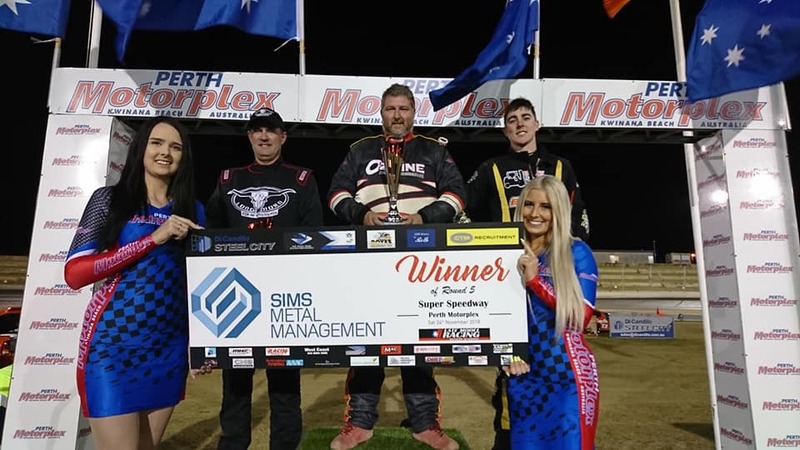 Courtesy of tonight’s results, Marc Giancola now leads the Sims Metal Management Pro Dirt Series by one solitary point over Holmes with Jay Cardy in third, while in the Perth Motorplex Track Championship it is the exact same top three, albeit a few more points apart. Late Models now have a fortnight’s break before returning to the Perth Motorplex once again, this time on Saturday the 8th of December for the ‘General’ John Day Classic. This will be Round Six of the Sims Metal Management Pro Dirt Series. Heat One, 8 laps: 1. 91 Michael Holmes, 2. 99 Ryan Halliday, 3. 26 Ken Macpherson, 4. 52 Jay Cardy, 5. 83 Daniel Ameduri, 6. 41 Kye Blight, 7. 0 Brad Blake, 8. 14 Willy Powell, 9. 60 Jayden Meckenstock, 10. 17 Daniel Green (7). DNS: 38 Jai Mazzini. Total Time: 2.20.840. Winning Margin: 0.218. Fastest Lap: 17.079 Jay Cardy. Heat Two, 8 laps: 1. 4 Brent Vosbergen, 2. 31 Paul Stubber, 3. 75 Mick Comley, 4. 15 Warren Oldfield, 5. 43 Marc Giancola, 6. 84 Chris Pavlovich, 7. 23 Joe Chalmers, 8. 50 Veronica McCann, 9. 19 Simon McNab, 10. 318 Freddy Kinsella. Total Time: 2.19.218. Winning Margin: 0.665. Fastest Lap: 16.781 Paul Stubber. Heat Three, 8 laps: 1. 31 Paul Stubber, 2. 23 Joe Chalmers, 3. 99 Ryan Halliday, 4. 91 Michael Holmes, 5. 26 Ken Macpherson, 6. 83 Daniel Ameduri, 7. 50 Veronica McCann, 8. 14 Willy Powell, 9. 84 Chris Pavlovich, 10. 318 Freddy Kinsella. DNS: 17 Daniel Green. Total Time: No Time. Winning Margin: 4.591. Fastest Lap: 16.741 Paul Stubber. Heat Four, 8 laps: 1. 41 Kye Blight, 2. 15 Warren Oldfield, 3. 0 Brad Blake, 4. 43 Marc Giancola, 5. 52 Jay Cardy, 6. 4 Brent Vosbergen, 7. 19 Simon McNab, 8. 60 Jayden Meckenstock, 9. 38 Jai Mazzini, 10. 75 Mick Comley. Total Time: 2.16.754. Winning Margin: 1.754. Fastest Lap: 16.426 Kye Blight. Feature, 30 laps: 1. 91 Michael Holmes, 2. 99 Ryan Halliday, 3. 41 Kye Blight, 4. 43 Marc Giancola, 5. 15 Warren Oldfield, 6. 26 Ken Macpherson, 7. 50 Veronica McCann, 8. 4 Brent Vosbergen, 9. 83 Daniel Ameduri, 10. 75 Mick Comley, 11. 52 Jay Cardy, 12. 31 Paul Stubber (29), 13. 84 Chris Pavlovich (29), 14. 19 Simon McNab (28), 15. 60 Jayden Meckenstock (28), 16. 23 Joe Chalmers (28), 17. 14 Willy Powell (28). DNF: 318 Freddy Kinsella (15). DNS: 0 Brad Blake, 17 Daniel Green, 38 Jai Mazzini. Total Time: No Time. Winning Margin: 1.553. Fastest Lap: 16.809 Kye Blight.